Apart from confirming the new camera, though, Nikon has not offered any firm technical information, leaving experts to speculate about the features its new professional DSLR might have. It will replace the D4S, a camera first introduced in February 2014, itself a development of the Nikon D4, launched two years earlier. This is a very important camera and market sector for Nikon because it targets professional sports, press and wildlife photographers who depend on the D4's combination of ruggedness, low-light performance, continuous shooting speed and extensive accessories. To the casual observer, the D4S looks unremarkable. Its 16-megapixel sensor is designed for low-light sensitivity rather than outright resolution, and its 11fps continuous shooting speed is matched or even exceeded by the latest crop of high-end mirrorless cameras. But the success of the D4S, and its chief rival the Canon EOS-1D X, lies in its proven resilience and track record, the backing of a range of professional lenses yet to be matched in the mirrorless market and a host of less obvious advantages, such as its huge buffer capacity. In continuous shooting mode – it can capture 60 uncompressed 14-bit raw files, or 176 compressed 12-bit raw files, when most consumer cameras would struggle to capture a dozen. It also has a massive battery life of 3,020 shots (5,960 in continuous shooting). The DSLR design also allows the use of dedicated phase detection autofocus systems that have still yet to be beaten by mirrorless autofocus systems, even those using the latest hybrid on-sensor phase detection pixels. Nikon has offered no technical information about the D5, but given its position in the market and current technologies, it seems likely that the D5 will have a new sensor, improved continuous shooting performance and tweaks to the autofocus system. These will be the three key areas for its target audience. The existing 16 megapixel resolution might not sound much by today's standards, but it's easily enough for regular commercial print and magazine usage and it does keep processing overheads to a minimum – a major factor in maintaining high shooting speeds. If Nikon does decide to increase the resolution to, say, 24 megapixels (it's used 24-megapixel sensors already in its full-frame cameras) then it will need to boost the camera's processing power to cope. This could mean a new generation 'Expeed 6' image processor, and this could also signal improvements in high-ISO noise control to maintain the low-light reputation of the D4S with the higher pixel count. It seems likely Nikon will also improve the continuous shooting speed from the current 11fps maximum, though we would expect only a small improvement here – it's likely that full-frame DSLR mirror/shutter mechanisms are already at or near their maximum operating speed. There's no word yet on any upgrades to the autofocus system. Nikon's 51-point AF module has been around for a few years, but a process of steady development has kept it right at the forefront for subject acquisition and tracking moving subjects. 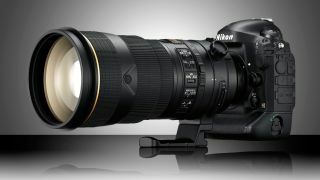 Nikon has also announced the development of a new WT-6 wireless transmitter and SB-5000 Speedlight. The current WT-5 is a high-end accessory used for connection to wireless networks, live view control via a computer and the simultaneous release of several cameras. The SB-5000 will be positioned at the top of Nikon's Speedlight line-up, a position currently occupied by the SB-910, which has a guide number of 34 at ISO 100, full automatic or manual control, full swivel/tilt movement for bounce flash effects and a Commander mode for controlling other Nikon Speedlights remotely. We'll bring you more news on the Nikon D5 just as soon as we have it.